Moonwalking with Einstein is a book by Joshua Foer that looks at the modern revival of the 2,500 year old craft of memory. The book describes the journey of the author as he goes from a journalist who is writing an article about memory competitions, to a mental athlete, obsessed with the sport, who eventually wins the 2006 USA Memory Championship. I’m writing this book review from the perspective of someone who is training in competitive memory techniques with the intention of entering the competitions that Joshua Foer writes about in this book. The early part of the book covers stories that most mnemonists (and mnemonists-in-training) will be familiar with like Simonides, Shereshevsky, and how the brain structure of London taxi drivers is physically different from most other people. 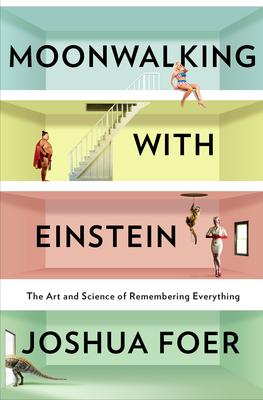 The book explores many fascinating aspects of human memory as Foer meets with well-known savants and brain researchers as he trains for the 2006 USA Memory Championship. Ed had explained to me that the competitors saw themselves as “participants in an amateur research program” whose aim was to rescue a long-lost tradition of memory training that had disappeared centuries ago. I imagine that most highly dedicated memory enthusiasts have these kind of thoughts, but there are very few people to share them with who understand. To see them in a mainstream book is a great thing. Dr. Yip Swee Chooi, the effervescent Malaysian memory champ, used his own body parts as loci to help him memorize the entire 56,000-word, 1,774-page Oxford Chinese-English dictionary. Edit: as Yan mentioned in the comments below, the above quote seems to be incorrect. Dr. Yip Swee Chooi apparently doesn’t use his body for storing the dictionary, but uses memory journeys through shops and other locations. A video about his technique is here. [In the poem competition, Gunther Karsten] assigns every single word to a route point… he has created his own dictionary of images for each of the two hundred most common words that can’t easily be visualized. “And” is a circle (“and” rhymes with rund, which means round in German). “The” is someone walking on his knees (die, a German word for “the,” rhymes with Knie, the German word for “knee”). When the poem reaches a period, he hammers a nail into that locus. Many actors will tell you that they break their lines into units they call “beats,” each of which involves some specific intention or goal on the character’s part, which they train themselves to empathize with. This technique, known as Method acting, was pioneered in Russia by Konstantin Stanislavski around the turn of the last century. …[he] has been developing a new mnemonic system for the [names and faces] event that would assign numerical codes to eye color, skin color, hair color, hair length, and mouth shape. [Anders Ericsson] told me to find a metronome and to try to memorize a card every time it clicked. Once I figured out my limits, he instructed me to set the metronome 10 to 20% faster than that and keep trying at the quicker pace until I stopped making mistakes. Whenever I came across a card that was particularly troublesome, I was supposed to make a note of it and see if I could figure out why it was giving me problems. It worked, and within a couple of days I was off the OK plateau and my card times began falling again at a steady clip. “Don’t try to see the whole image,” [Ed Cooke] said. “You don’t need to. Just focus on one salient element of whatever it is you’re trying to visualize. If it’s your girlfriend, make sure that before all else, you see her smile practice studying the whiteness of her teeth, the way her lips freeze the other details will make her more memorable, but the smile will be key. Sometimes a stab of blue that smells of oysters might be all the recall you get from some particular image, but if you know your system well, you should be able to translate that back again. Often, when you’re really coming for it, the only traces left by a speedily pack of cards will be a series of emotions with no visual content whatsoever. …since every change to your mnemonic system leaves behind a trace that can come back to haunt you in competition. And if there’s one thing a mental athlete wants desperately to avoid, it’s for a single card or number to trigger multiple images on game day. One of the most important chapters in the book is about the history of memory techniques in education. Foer writes about why there was a backlash against memorization in education, and how things may have swung too far in the wrong direction. Memorization has been completely ripped out of some educational methods with detrimental results. Modern experiential education is great, but it should be balanced with intense training in the memorization of information. I remember a history teacher once telling me that it wasn’t important to memorize dates, but just to know the overall concept of events throughout history. With what I know about memory now, that was the worst possible advice. The first thing that one should do is memorize all the dates. …you can’t have understanding without facts. And crucially, the more you know, the easier it is to know more. Memory is like a spider web that catches new information. The more it catches, the bigger it grows. And the bigger it grows, more it catches… There is a feedback loop between [memory and intelligence]. I think that memory techniques are a very powerful way to increase creativity. Improved creativity is one of the first benefits I noticed when I first started memory training. If you have any interest in the subject of memory, this book is essential reading. Finally, there is a book that I can recommend to people when they gave me strange looks about my hobby of trying to memorize long strings of what appear to be cold, meaningless numbers. I see the arrival of this successful book as being a major step in paving the way for the revival of the ancient, lost craft of memory. The book is easy to read and provides a more gentle introduction to the topic than most memory enthusiasts are able to provide. The book doesn’t provide detailed instructions on how to memorize things, so if you are interested in learning memory techniques after finishing the book, check out my list of recommended memory books. EDIT: for another review of Moonwalking with Einstein, check out pwgearguy’s review. Thank you so much for being on this book tour. I have to admit that the field of memory competition is completely new to me, so I really found your review fascinating, coming as it does from an “insider’s” perspective. I agree that Foer’s book is a fascinating read but there are some details he got wrong. Like, for instance, Dr. Yip Swee Chooi doesn’t use his body parts but a journey for each page on the book, with each word on the page placed on a locus on the journey. Thanks — I updated the post above. Hey, I’m learning English, and one of the best way to learn is to read, books and articles that’s matters to us, I’m very interrested about memory and your book is rather exiting as I read your resumer, so I go to amazon.fr now and I buy your book, promise ! That’s Ok, just bought from amazon.fr, I’m waiting for the book now, plan to receive in 5-6 days. Thanks — I’ve updated the post above with a link to your comment. Thanks for the post, quick question from a newbie such as myself–does memorizing random numerical sequences/strings amount to any practical memory gains in day to day life? What I mean by this, is do seemingly meaningless memory exercises result in meaningful results in day to day memory? I’ve read the book. And I believe the conclusion was an answer to your question. And the answer is generally, no. General memory improvement is elusive. Improvement on particular categories you may need can be achieved with practice with those specific things. and I need to work on memorizing formula’s and lists of vocabulary. Like I said. My understanding from Moonwalking With Einstein and other blog posts is that all improvements are the result of techniques learned, and techniques are often subject specific. And really most natural applications are either unnatural or unnecesary in real life. Memorizing numbers for instance, the only numbers we need to memorize in ‘real life’ are ID numbers and phone numbers. There aren’t as many ID numbers as we complain about, and who remembers phone numbers when we can justg input them into our phones virtually errror free. Actually if one of you more experienced fellows wishes to reply to tourshi aswell I would greatly appreciate any tips in memorizing formulea. I’ve tried making visual images and the like. sqare bee’s for b squared, and squared off roots for square roots. But I don’t know if it is helping. Dominic O’ Brien advocates that seemingly meaningless memory exercises can lead somebody to a general better memory. In order to be able to perform memory feats, you’re going to need to develop concentration – the bigger your concentration span gets, the better you’ll get to memorize anything. Check this out “Dominic now refers to his dyslexic condition in the past tense as though he no longer has it. It is quite obvious that his attention problems have disappeared (you don’t get to be World Memory Champion with failing concentration!) – but what about his dyslexia? Dominic is totally convinced that having trained his memory to a remarkable level (he would be the first to agree with me that “remarkable” refers to the fact that very few people do, rather than that they can’t), his mind has evolved to the degree that dyslexia no longer causes him any problems”.